Back To Back Gold For Blatz! "It feels just as good as the first time." 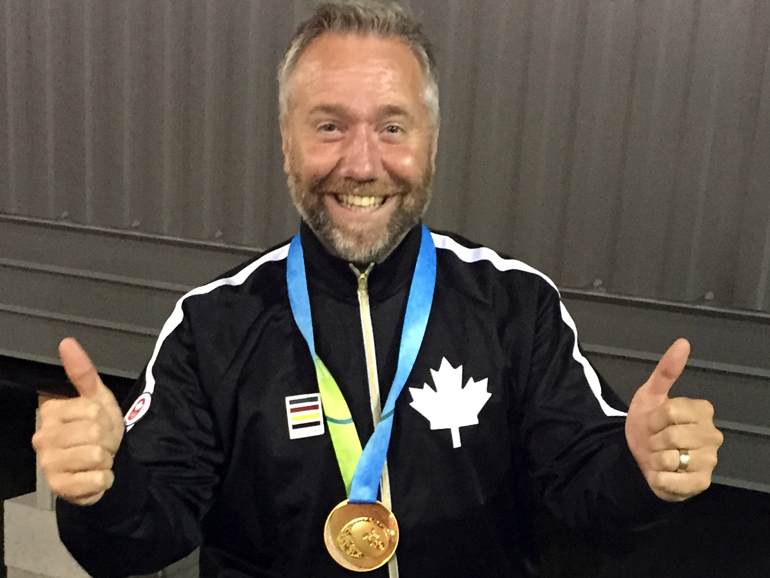 Those are the words of Steinbach Athletic Therapist Dave Blatz, reacting to Sunday's gold medal win at the Pan Am Games in Toronto. Blatz worked as Head Athletic Therapist for Team Canada Baseball. On Friday, the Canadians lost 4-1 to the Americans in the last game of the Preliminary Round. It was Canada's first loss of the tournament after winning its first five games. Canada and the U.S. each won their Semi Final games on Saturday, setting up a Canada/ U.S. Gold Medal Game on Sunday. In that game, the Canadians scored three runs in the bottom of the 10th inning to win gold. "I've never seen anything like that in my entire life," says Blatz, referring to the throwing errors that led to Canada's last two runs. "I've been around baseball for a very long time." In fact, he says even Coach Ernie Whitt and Assistant Coach Larry Walker, two former Major League players admit Sunday's finale was unlike anything they have ever witnessed. Blatz says the format for breaking a tie is different in international play. A team is allowed to start the extra inning with runners on first and second base and nobody out. This led to the Americans scoring two runs in the top of the 10th inning. Then, down 6-4 in the bottom of that inning, Blatz says they failed to get their bunt down and the Canadians were quickly down to their final two outs. He says at that point things looked bleak, that is, until a throwing error later in the frame would result in Canada winning gold for a second straight Pan Am Games. "That medal in Guadalajara in 2011 it was amazing, because we'd never won at Pan Am Games before, so it was absolutely a huge feather in the cap for baseball in Canada," says Blatz. "This time around we had a lot of experienced guys so they kind of walked some of the younger guys through it. Any time you can beat the U.S. in a gold medal game, doesn't matter if it's the first time or the tenth time, it's still an absolutely amazing feeling and it's something I will never, ever forget." He notes even Walker and Whitt have said this was one of the greatest experiences of their lives. Blatz says there was a lot of parity between Canada and the United States at these games. But he says it was probably Canada's pitching, that in the end, led to their victory. He notes their bullpen had been used sparingly throughout the tournament and then to be able to throw former Major Leaguer Jeff Francis on the mound in that final game, was key. Blatz says for the first 24 hours after the win, there were a lot of high fives and jubilation from everybody in the Athletes' Village. But Blatz is back home in Steinbach and the players have now gone their separate ways, with many of them returning to their minor league or major league clubs, Blatz says there is a bit of a setback for some, with not having that same level of pride or same type of competition. However, he says the team will be back together in November when they enter the Premier 12 World Cup in Taiwan. Blatz says he loves representing Steinbach and the Eastman region and is so appreciative of all the messages he received from back home both before and after the gold medal game.